AZUZ: In a week since the deadly shooting at a high school in Southeast Florida, students around the state and other parts of the country have staged demonstrations, walk-outs and marches. They've been showing support for the victims of the shooting and calling for communities and state and federal governments to take action to prevent shootings in schools. A listening event held at the White House on Wednesday gives you a sense of what some of them are saying. UNIDENTIFIED FEMALE: The bill was also passed that declared that each school has to go through one drill each month. But I know that my school, we go through fire drills every month and we were — we have not had our lockdown drill yet this year. And I think a change that we'll increase all the trainings and protocols, so if, God forbid, another shooting does happen, at least all the teachers will be prepared and can hopefully keep their students calm. UNIDENTIFIED FEMALE: The solution is not going to be a singular thing. It's going to be multifaceted and it's going to be created by a collection of different people working together and we all have to realize that we all have our opinions and together, we're going to be able to work to a solution. UNIDENTIFIED MALE: There needs to be significant change in this country, because this has to never happen again, and people should be able to feel that when they go to school, they can be safe. UNIDENTIFIED MALE: It's not left and right. It's not political. It's a human issue. People are dying. And we have to stop this. We have to stop this. If he's not old enough to buy a drink, to go and buy a beer, he should not be able to buy a gun. UNIDENTIFIED MALE: And I don't understand I could still go in a store and buy a weapon of war. 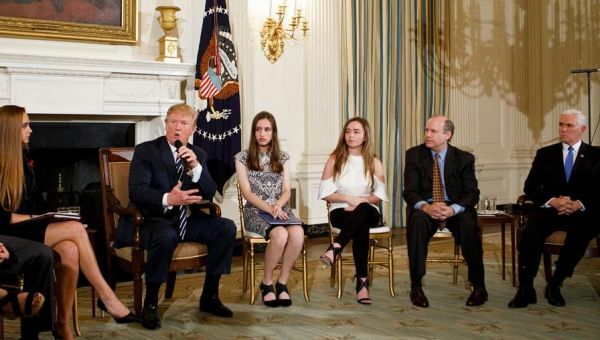 DONALD TRUMP, PRESIDENT OF THE UNITED STATES: If you had a teacher with, who was adept at firearms, they could very well end the attack very quickly. And we're going to be looking at it very strongly and I think a lot of people are going to be opposed to it. I think a lot of people are going to like it. UNIDENTIFIED MALE: If a teacher or a security guard has a concealed license and a firearm on their waist, they're able to easily stop the situation. Or the bad, I put that way, guy would not even go near the school knowing that someone can fight back against them. UNIDENTIFIED MALE: School teachers have more than enough responsibilities right now than to have to have the awesome responsibility of lethal force to take a life. AZUZ: President Trump has voiced support for raising the legal age at which Americans can buy guns, outlawing certain components for guns and expanding background checks to focus on gun viewer's mental health.